Shopping in Cozumel is one of the vacationers favourite pastimes. In fact many of the cruise liners stop here specifically for that reason. Cozumel’s most varied shopping area is around San Miguel’s zócalo (Plaza del Sol) and extends for about 8 blocks along the waterfront and for several blocks back into the town. The island of Cozumel lies off the eastern coast of Mexico along the Yucatan peninsula. It is one of the most popular scuba-diving destinations in the world. Because Cozumel is a port of call for many cruise lines, the island offers numerous shopping opportunities. There are some fantastic bargains as long as you know where to look. Find gifts and souvenirs at the town square, known as Plaza del Sol that extends along the waterfront. 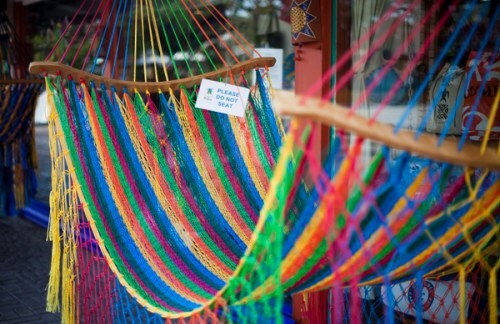 Good buys can be found on Yucatecan hammocks, leather goods, embroidered and lace clothing and table linens, silver jewelry, ceramics and decorative metalwork and carved wood. When buying sterling silver, always make sure you see .925 stamped on the item. Gold items should be stamped with a set of two numbers and two letters (in any combination).You will also find high-quality handicrafts from all over Mexico. Walk a few blocks behind the Plaza, heading east, to find bargains. Less expensive and often identical merchandise can be found just off the hustle and bustle of the Plaza for travelers willing to hunt for a deal. There are scores of shops and open-air stands where peddlers sell a variety of crafts and sundry items, such as straw hats and blankets, for less than Plaza prices. Always haggle for bargains. A tourist who pays full price for an item from a street vendor probably did not try to negotiate a better deal. Try offering half the stated price to start the bargaining. All of the street vendors are used to this every day and even enjoy the game. Apart from haggling for the best deal for handicrafts there is also an area with upscale designer jewelry and clothes stores such Van Cleef & Arpels and Diamonds International among many others. Pay cash whenever possible when shopping in Cozumel, but if credit cards must be used, write down the final price in pesos and dollars U.S. on the receipt.